This once-a-year best restaurant deal in New York City is so generous that it left me stunned. When our waiter brought the bill for my lunch with a friend, it tallied $13.00 for the two of us. Depending on the establishment you pop into in Manhattan, that’s generally less than the cost of two sandwiches at a deli counter. Yet we dined at Café Centro, a lovely sit-down restaurant with a French-Mediterranean menu and white tablecloths, sited in what may be the most central location in the city— Grand Central Station. It’s a great meeting spot because if you arrive by train or subway, you don’t have to go outdoors in inclement weather. You simply take an escalator up one floor from the train station and follow the passageway to the MetLife Building. The restaurant, which has both indoor and outdoor seating, is tucked in the spacious light-filled corner of the building that’s on Park Avenue at the corner of 45th Street. With a large open kitchen, the room is energetic but relaxed and has the look of a French brasserie. We were seated at a cozy corner table on one of the banquettes. Service was prompt and efficient. A couple minutes after we arrived, our waiter brought a long, irresistible, freshly baked baguette to our table and took our orders. At lunch, you can either order à la carte or from the three-course $34 fixed price menu, which offers a wide choice of fresh fish, seafood, meats, salads and sandwiches. You can also choose items from the raw bar. 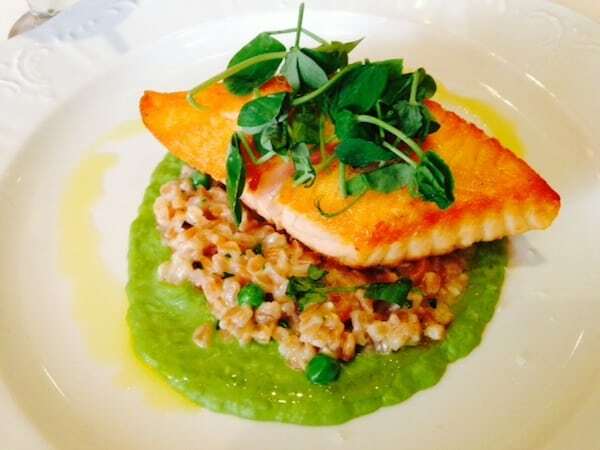 I ordered the à la carte grilled Atlantic salmon with English peas, bacon and faro risotto (There was no problem requesting it without the bacon, suggesting it was prepared to order). It was absolutely delicious. My friend ordered sea bass with melted leeks in a saffron mussel broth. The chicken chop-chop salad at the table next to us also looked amazing! Patina is a large group that operates multiple restaurants on the West Coast (California), the East Coast (New Jersey, Florida and more than 19 in New York City). It just opened another property in Tokyo. If you sign up for the infrequent Patina newsletter on the website, there is a special birthday offer; for your birthday month, your receive a coupon by email allowing you to use either a $30 (off a $30 purchase) or $50 off (a $50 purchase) coupon (the amount depends on the location where the coupon is redeemed). The certificate is valid for up to 60 days after issuance. I printed out the coupon and brought it with me. Our lunch bill totaled $63 and my jaw dropped when the waiter adjusted the tab to $13. Of course, we left him a hefty tip thrilled to take advantage of one of the best bargains in New York City. Previously, I have eaten in two other restaurants operated by the group, Lincoln at Lincoln Center (where the coupon isn’t applicable) and at Brasserie 8 ½ on 57th Street and enjoyed both meals there as well. The restaurants are conveniently situation near many NYC attractions. I realize that this post may sound a bit advertorial but it is NOT sponsored. I was simply bowled over by the value. And even if you are couponless, it’s still a great option in the area of Grand Central Station. Reservations at 212 818-1222 (phone) or online on Open Table. If you are arriving at the restaurant by car, OneParking offers a special rate of $25 for up to four hours of parking, a $25 savings in an area of the city where parking spots are at a premium. The restaurant is also open for power breakfasts and offers a $36 price fixed dinner. If you get lost on your way through the terminal, helpful security guards seem to be positioned all around to point you to the restaurant. Looks good! And worth checking out… In Vancouver, many restaurants offer low-cost, fixed-price, 3- and 4-course menus during “Dine Out” in February. All the participating restaurants are packed, and reservations are essential (hard to get too). It’s a great opportunity to try out some of the more expensive places that one normally wouldn’t go to. What’s nice about this promotion is that you can use it any time over a two month period and because birthdays fall throughout the year, everyone doesn’t have use the certificate during the same time window. This is a super deal! I’m going to check into it. Your lunch looks fab. Haven’t been to Café Centro — great location, for sure.